Take a look at a couple views of the 2014 Ford C-Max Energi in Ruby Red Metallic Tinted (stock# 3688). This great-looking vehicle is versatile in so many ways, from its roomy interior with a configurable cargo area, to its Hybrid Gas/Electric engine. The large panoramic moon roof provides breathtaking views of the sky and a spacious feeling interior. State-of-the-art technology blends nicely with the aesthetics and keeps all your important controls within reach. This C-Max Energi also includes the Hands Free Technology Package, for when you don’t really feel like reaching. Stop by or call us at 888-829-5903 for more information and to schedule a test drive! Visit our website for a complete list of our new and used vehicles. Get more info and find directions to our store at sandyspringsford.com. We even provide the same excellent experience for our out-of-state customers; we work with transporters that can deliver right to you. 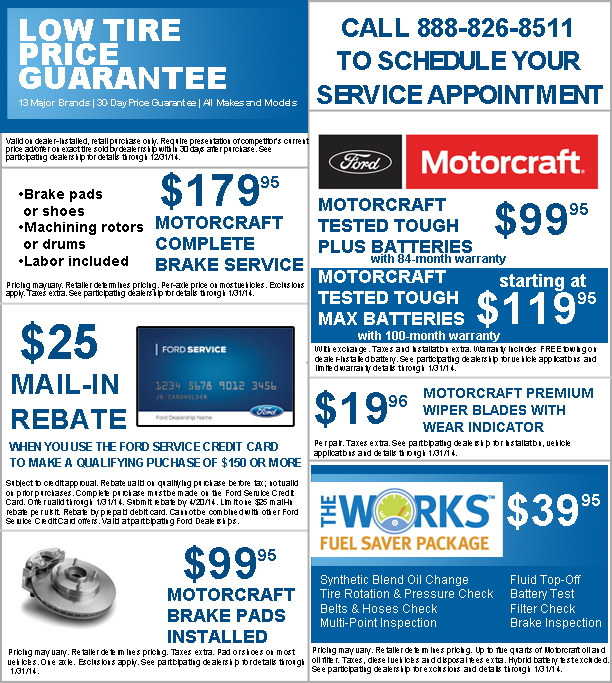 Save big on Motorcraft brake service, batteries, and wiper blades. Use the Ford Service Credit Card for even bigger savings. Call 770-677-0800 to schedule your service appointment or use our convenient online scheduling tool. Be sure to mention the coupon to your service advisor when making the appointment. Don’t forget to print this page and bring it along.